Tapes on the Floor: Album Review: Broken Bells "Broken Bells"
Album Review: Broken Bells "Broken Bells"
If there's one thing I consistently enjoy these days, it's a Danger Mouse-produced record. Brian Burton has had a pretty flawless track record ever since taking his first turn behind the boards on the Gorillaz album Demon Days. His production roster ever since reads like a who's who of innovative artists and groups; from MF Doom, to the Black Keys, to Beck. A collaboration between Burton and James Mercer of Shins fame is a no-brainer. Mercer is a great lyricist with an ear for infectious melody, while Burton is known for his ability to create unique sonic atmospheres that perfectly compliment the artists he works with. The two previously worked together on a pair of songs for 2009's Dark Night of the Soul, but neither of the tracks on that album really reflect the direction that Broken Bells' debut takes. Opening song "The High Road" is a near perfect introductory track, easing in with a stuttering keyboard riff before giving way to Mercer's acoustic guitar, backed by Burton on drums. It's immediately obvious that this isn't just a Shins record with Danger Mouse; it has a feel all its own, driven by straightforward guitar, liberal synth programming, and frequent vocal tweaks. "The Ghost Inside" finds Mercer launching into a falsetto over a disco-tinged backing track, an odd moment that works surprisingly well. There's something of a formula to most of the song, but its one that plays to the duo's strengths, with Mercer supplying the basic structure and Burton fleshing it out. 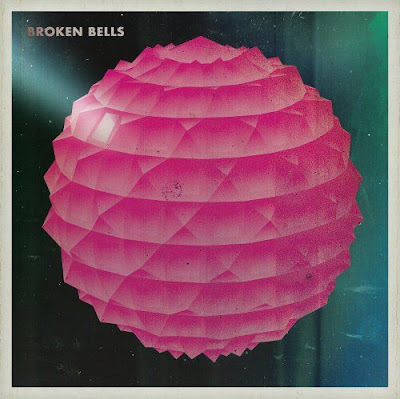 Thematically, Broken Bells seems to be a kiss off to someone with lines like "You never know how low an angry heart can go" and "A detour in your new life" denoting some sort of cataclysmic change in Mercer's recent history. Thankfully, Burton's upbeat production assures that the mood never gets too morose for its own good. Broken Bells doesn't rank among the higher echelons of either contributors' work, and it's entirely likely that this is just a one-off collaboration. Regardless, it's still one of the most solid and enjoyable records I've listened to this year.